This page deals with the recruitment and maintenance of armies. For specific combat mechanics see land warfare. For different individual unit types see land units. An army refers to a country's land forces. The basic unit of land forces is the regiment, each consisting of 1000 soldiers at full strength. Each regiment is classed as Infantry, Cavalry or Artillery. Regiments are grouped into armies. Each army can be led by a general or conquistador. Recruiting regular forces requires an owned, unoccupied province to recruit in, and three resources: manpower, ducats, and time. Each province can recruit one regiment at a time, though multiple regiments can be queued up in a single province. The base cost and time of a regiment depends on its type; this is then adjusted by any modifiers, in particular any buildings the province might have. Regiments start with 50% of maximum morale. It takes 1000 manpower to recruit a regiment. Manpower is also used for reinforcing depleted regiments. Regiment cost may be affected by general and type-specific modifiers which are summed. General modifiers reduce the cost of all types of land units. −20% The Land of Flames Maravian event: “The Land of Flames” for 1 year. Some specific modifiers reduce only the cost of one unit type. until end of Revolution disaster. until end of The Peasants' War disaster. −10% Grander Army Offensive ideas event: “Isn't our Army Grand?” for 10 years. for 5 years and 1 day. +10% Poor Iron Generic event: “Iron ore quality problems” for 2 years. −10% Surplus Equipment Quantity ideas event: “Surplus Equipment” for 10 years. +10% Nobility in Power Aristocratic Coup disaster event: “The $ESTATE_NOBLES$ Seize Power” until “Curtail the Nobility”. −10% Horse Population Boom Quantity ideas event: “Horse Population Boom” for 10 years. +25% Nobility in Power Aristocratic Coup disaster event: “The $ESTATE_NOBLES$ Seize Power” until “Curtail the Nobility”. +20% Poor Copper Generic event: “Poor Quality Copper” for 2 years. −10% Cheap Iron Quantity ideas event: “Cheap Iron” for 10 years. Recruitment time can be affected by countrywide and provincial modifiers which are added. −30% Recruits Flock to the Standards Offensive ideas event: “Recruits flock to the standards” for 10 years. for 5 years or the end of the War of the Roses. −15% Thriving Arms Industry Construction mission: “Create an army for our nation” for 10 years. Construction mission: “Protect against $COUNTRY$” for 10 years. To maximize combat effectiveness of an army, the ratio of infantry, cavalry and artillery is vital. To avoid the insufficient support penalty, an army must not surpass the maximum ratio of cavalry per infantry regiments. Artillery can fire from the second line, and therefore can vastly increase the effectiveness of an army. Artillery defends first line units from attacks with half of its defense points in the corresponding battle phase. Since artillery takes twice the normal damage when in the front line, it should be deployed in the second line. To achieve this, the number of artillery should not exceed the number of cavalry and infantry combined. Also reserves should be calculated to replace lost regiments in first line. With artillery being three times and cavalry two-and-a-half times more expensive than infantry, a more infantry heavy but cheaper army could be more cost-efficient, especially if a nation suffers from cavalry or artillery penalties. Eight infantry regiments can easily beat three infantry + two cavalry due to flanking effects. Having a 40 regiment army in a province with only 30 supply limit will cause massive attrition. It is wise to split an army in half when crossing territory with low supply limits in order to keep attrition at a minimum. For Eastern/Western factions where there are few nation bonuses to cavalry combat effectiveness, cavalry should be fielded only to maximize flanking effectiveness. The number of cavalry should therefore change with flanking range at military technology 18 and 30. To understand why, consider that infantry begins with 1 flanking range and cavalry 2. This means that if you outnumber the enemy, there is only need for 2 cavalry units for the far-flanks as your infantry will flank one unit to the side. This dynamic changes at military technology 18 where infantry has 1 flanking range, but cavalry has 3. Here, a minimum of 4 cavalry units (2 on each side) is required. The dynamic changes for the last time at level 30, where 6 cavalry units will be required for maximize flanking. This rule does not apply to non-Eastern/Western nations who may have cavalry combat effectiveness bonuses and/or inferior infantry units compared to their Eastern/Western counterparts. Therefore, if you are playing Anatolian, Muslim or Nomadic factions and seek only combat effectiveness, field as many cavalry as the insufficient support limit allows. Fewer losses will be sustained with numerical superiority. When above 10:1, victory may be granted with no combat. To attain numerical superiority, it may require exceeding the supply limit temporarily, especially if forces are technologically inferior. By splitting forces, it is possible to lure an enemy into an unfavorable position without exceeding supply limits. When defending against a numerically superior army, fighting in terrain with an attacker combat penalty is ideal. Rough terrain gives from -1 to -2 combat penalty for the attacker and is added to river or strait crossing penalty and amphibious landing penalty. An army needs a certain amount of money every month as maintenance. These cost can be influenced by the army maintenance slider of the economy interface. Reducing the maintenance slider can (multiplicatively) reduce maintenance cost by up to half, but also reduces reinforcement rates and morale. At 0% funding, regiments will not reinforce, and maximum morale will be reduced by 100% (additive with other percentage modifiers) to a minimum of 0.51 (the minimum required for an army to move). In other words, they cost 2% of their recruitment cost, multiplied by the sum of all maintenance modifiers, multiplied by the technology factor, per month. Therefore, any modifier that affects the cost of creating new regiments (at the time of recruitment) also affects the maintenance of units. These modifiers affect the maintenance cost of land units and generally work additively, except for the maintenance impact of +2% per military technology, which is multiplicative with all other factors. −15% for being the revolution target. until the death of the current ruler. +10% Administrative Problems Quantity ideas event: “Administrative Problems” for 10 years. −10% Regimental Pride Defensive ideas event: “Regimental Pride” for 10 years. The total maintenance cost of an army also depends on the land force limit of the country. If a country has more regiments than its land force limit, maintenance of all units will be multiplied by the ratio of units – with the units over the force limit counting twice – to the force limit. For example, if a country has 15 regiments and a land force limit of 10, the maintenance of each regiment is doubled. While quantity is an important factor in warfare, quality could be considered even more crucial in the grand scheme of things. An army outnumbered by 10,000 men can find victory in better discipline and morale, and as an opponent of war-orientated European continentals such as France and Prussia, many will most likely experience the effects of these high-quality armies at some point. Choosing the right land units as military technology advances can synergize well with a country's national ideas and abilities. At any point, it is better to upgrade troops when possible and pick the specific variation afterwards than stay with the older weaker troop type. Several idea groups can be taken to progressively improve armies' performance on the battlefield. Additionally, some countries get specific bonuses resembling the strength their army had in actual history. Morale indicates how long an army can keep fighting without routing. It is affected by both prestige and power projection, which increase morale by +0.1% for every point. Morale recovery affects how long an army will take to recover to full morale after it was lost in a battle or by changing the maintenance slider. Discipline is a very important combat modifier, as it both multiplies the amount of casualties and the morale cost of these casualties. It starts off at 100%. Combat ability is a value that is multiplied with the units' damage dealt (both for casualties and morale), making it work similarly like discipline, but only for a specific type of unit while discipline affects infantry, cavalry and artillery alike. It also has no effect on military tactics, unlike discipline. These modifiers affect the base attributes of the military leader and are added on top of them. Tibetan idea 2: Bön Influence. Army tradition provides powerful boons to the offensive power of armies. It also provides a higher chance of getting land leaders with a high fire/shock/maneuver/siege value. 100 army tradition gives the following bonuses, which scale linearly to 0% at 0 tradition. An army will take attrition damage on the first day of each month if the total supply weight of all non-hostile armies in the province exceeds the supply limit of that province. This can happen even in owned provinces. The amount of attrition depends on the supply weight of all troops in that province in comparison to the local supply limit. The only exception to this is if an army has moved into a province where two hostile forces are engaged in combat. As the combatants are temporarily neutral to the newly arrived army, some of their supply weight will still be added to this armies' and may cause attrition. There are currently no ideas to alter this further. Under normal circumstances, the amount of attrition is x%, where x is 10/supply limit, for each point of supply weight in excess of the local supply limit, up to a maximum of 5%. Armies that are besieging hostile provinces take 1 unit of supply weight extra attrition, regardless of their size. An army trying to take back its own captured province does not suffer this penalty. For the duration of a battle, the armies engaged do not suffer attrition. Example: An army with 20 supply weight in a province with 17 supply limit would normally take (20 - 17)*(10/17) = 1.76% attrition each month. If that army were besieging a hostile province it would suffer (20 + 1 - 17)*10/17 = 2.35% attrition. Attrition damage is applied before reinforcements, so an army suffering from attrition will not take noticeable damage unless the attrition exceeds the reinforcement rate. This can mask an otherwise severe drain in manpower due to attrition, so players are advised to pay careful attention to any army with the attrition icon ( ). The attrition damage taken by a unit is proportional to the current strength of the unit and not the maximum strength of the unit. Climates that increase attrition according to the in-game tooltips act by increasing each army's supply weight instead. Devastated provinces will also increase local attrition rates. Attrition stacks additively. The 7th idea of the Defensive Ideas group, Improved Foraging, reduces all attrition taken by friendly armies by 25%, applied multiplicatively. For example, an army under the supply limit with Improved Foraging besieging an enemy province takes 0.7% monthly attrition. It would make sense for the attrition to be 0.75% monthly, but the attrition display indicates 0.7%. The bonus for completing the Defensive Ideas group causes enemy troops to take 1% attrition on top of normal attrition values while in friendly territory. Ideas which reduce attrition are applied after reaching the attrition cap, so an army with -25% attrition damage has an effective maximum attrition of 4%. Land Attrition is capped at -80%, resulting in 1% maximum attrition. Army regiments that have taken casualties will gradually reinforce up to their full strength according to available manpower, or if they are mercenaries - usually at a significant cost. However, if they gain more soldiers monthly than they lose to attrition, there is no extra cost beyond base army maintenance, so reinforcement speed modifiers can save you a lot of money - even so, beware of heavy attrition. The army maintenance factor scales linearly with the position of the army maintenance slider. It is 50% if the slider is at the far left and 100% if the slider is at the far right. The local reinforcement modifier is 100% in owned provinces, 10% in uncolonized provinces, and 50% otherwise, be it a neutral, subject, ally, enemy, or occupied province. If the army has a leader, each point of maneuver will increase the local reinforcement modifier by +10% additively up to a maximum of 100%. An army that has been in battle will suffer a temporary −40% penalty to their local reinforcement modifier for the current month if they are not in owned territory. The reinforcement speed modifiers from ideas, policies, advisors etc. are summed up. All values above can be seen or deduced from the tooltip over each army's total soldier count. The base reinforcements are up to 100 per Regiment, depending on army status and location. Additional reinforcements from reinforcement speed modifiers don't cost extra. Mercenary forces can serve as a supplement – or replacement – for a country's regular forces. They are only available in limited number. Mercenaries can be recruited in any controlled province (including occupied territory), unlike regular forces which require cored ownership or a subject province. Mercenaries are more expensive to maintain than regular forces. They are also quick to recruit and do not cost any manpower to build or reinforce. This is a multiplier, not a -75% modifier. No manpower cost to recruit or reinforce. The number of mercenaries a nation can field is determined by their mercenary support limit, which replaced the mercenary pool. Every country has a base of 20 regiments plus 30% of its regular land force limit. This sum is modified by the available mercenaries modifier. +12.5% during the English “War of the Roses” disaster. +0.3% per point of army professionalism below 50 (i.e. 15% at 0, 0 at 50% or higher). +50% Mercenaries flocking to the standard Plutocratic ideas event: “Mercenaries flock to the Standard” for 10 years. +50% Glut of Mercenary Companies Administrative ideas event: “Glut of Mercenary Companies” for 10 years. Option: ‘We should prevent this from happening in the future.’. +25% Scottish Mercenaries Thirty Years' War event: “Scottish Mercenaries” for 30 years. Note: The ‘available mercenaries’ modifiers affect also the maximum number of regiments for condottieri (only with Mare Nostrum DLC). There is a +150% modifier to mercenary maintenance. This is affected by mercenary maintenance modifiers. This is computed off the regular recruitment cost, not the mercenary recruitment cost. Aside from regulars and mercenaries, there are five other categories of units with unique recruitment mechanics and modifiers that are each available only to countries that meet certain conditions. Because they are each recruited in a unique way, none cost ducats, manpower, or time to recruit, but unless stated otherwise they start at low morale and are maintained and reinforced at the same ducat and manpower cost as regulars. Banners are a special unit category available to nations that have Manchu as their primary culture and are available to the Mongol Empire. Banner units are displayed with a purple background in the army view. The total number of Banners can be viewed in the Military tab (shortcut .) by hovering over the total number of individual unit type. Banners have +10% discipline -- they can still be drilled -- and can be cavalry or infantry. Banners are recruited in the state interface in states with primary culture cores (can be territorial cores). For Mongol Empire, this can be any culture that is set as the primary culture of the empire. For all others, banner units will no longer be available if primary culture is changed beyond Manchu. The exact unit type (cavalry vs infantry) depends on the total army composition. A newly raised banner unit will be cavalry unless the total cavalry proportion is at or over the cavalry to infantry ratio of the raising nation. In each state, 1 banner regiment can be recruited for every total 10 development (rounded down) from provinces that are of the nation's primary culture. Availability is modified by the possible manchu banners modifier. It costs +1% corruption per banner regiment raised divided by the country's force limit. Unlike other special unit categories, banner units spawn at full morale but only have 100 men when recruited and must be reinforced to full strength. They reinforce at the normal reinforcement rate. However, they cost no manpower to reinforce, meaning that after the initial corruption cost of recruiting them, they can be thought of as powerful mercenaries with the cost of a normal army. The Age of Absolutism ability Manchu Banners, available only to Manchu and Qing, gives +50%. Each age after the age of discovery gives a cumulative +50%. For example, Mongol Empire in Age of Revolutions gets +150% possible banners. With that, 1 banner regiment can be raised per 4 primary-culture development (rounded down). Streltsy are a special unit category available only to countries with one of the three governments unique to East-Slavic-culture nations (Veche Republic, Russian Principality, and Tsardom), and are displayed with a silver background in the army view. Streltsy are always infantry and have +10% fire damage compared to other unit categories. They can be recruited by using the government action "Raise Streltsy", which will raise a number of Streltsy infantry regiments equal to 20% of your force limit in your capital while also reducing war exhaustion by 2. However, over-reliance on Streltsy is penalized: for each 1% of the country's force limit composed of Streltsy, a +1% stability cost modifier malus is applied. Cossacks are a special unit category available only to countries that have access to the cossacks estate, and are displayed with a gold background in the army view. Cossacks are always cavalry and have a +10% shock damage bonus. Cossacks can be recruited with the cossacks estate interaction "Raise Cossack Host", which will recruit one cossack cavalry regiment per province assigned to the cossacks, up to a maximum of 5 regiments (10 if their influence is over 60). This interaction is available at 50 loyalty, 40 influence, and will add +5 influence and −15 loyalty to the cossacks while having a 5 years cooldown. Janissaries are a special unit category available only to countries with the Ottoman government, and are displayed with a red background in the army view. They are elite infantry troops with −10% fire damage received, −10% shock damage received, and +100% army drill gain modifier. However, unlike other special units, janissaries are +100% costlier to reinforce. Janissaries can be recruited from the state interface of states comprising heathen provinces: each 10 heathen development in the state gives 1 janissary regiment. This costs 10 military power per regiment raised. Over-reliance on janissaries may trigger the Janissary Coup disaster after the end of the 'Age of Discovery'. Rajputs are a special unit category available only to countries that have access to the Rajputs estate, and are displayed with a blue background in the army view. 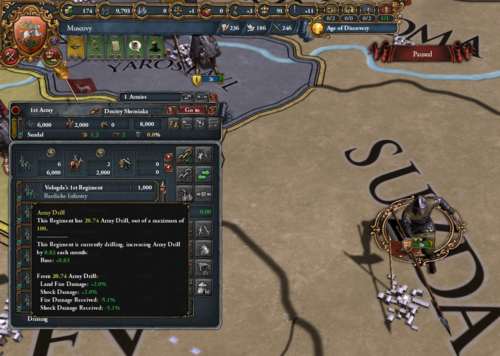 Rajput are always infantry and have a +5% morale bonus as well as a −25% army drill decay modifier. Unlike other special units, they are −50% cheaper to reinforce. Rajputs can be recruited with the Rajputs "Recruit Rajput Regiments" estate interaction, which will recruit one Rajput infantry regiment per province assigned to the Rajputs, up to a maximum of 10 regiments. This interaction is available at 50 loyalty, 40 influence, and will add +5 influence and −15 loyalty to the Rajputs estate while having a 5 years cooldown. Cradle of Civilization introduced two new and linked concepts to the area of army management. Professionalism is an overall rating for a nation's land forces, while Drill level is specific to each regiment. Well drilled units are more effective in combat, and having units conduct drill is one of the primary means of building up a high level of professionalism, which unlocks new abilities for a nation's armies. May build supply depots: for 20 military power, an army can establish a supply depot in a friendly-controlled province. The supply depot will increase the friendly supply in the entire area by 50% and all friendly troops will reinforce as if they were in their home territory (ie the local reinforcement rate will be 100% instead of 50% even outside the national borders). If the province is occupied by a hostile force, the depot will be destroyed, otherwise it lasts for 5 years. May refill garrison: allows a unit to take some of its infantry strength to restore the garrison of a fort instantly, working in your own forts, as well as friendly and occupied enemy forts. Regain manpower when disbanding: instead of the manpower disappearing, disbanded regiments now return their soldiers to the manpower pool. −50% Reduced morale damage taken by reserve – regiments in the back row during a day of battle normally take passive morale damage in large ongoing battles, but will now take −50% as much. There are certain actions that will increase/decrease the army professionalism value. Hitting the Slacken Recruitment Standards button (adjacent to the buttons for activating and deactivating forts) will lower the army professionalism by −5% (to a minimum of 0%), but will give a nation two years' worth of manpower. Certain events and decisions will influence army professionalism as well. A muscovite army currently drilling. Drilling can be initiated by pressing the drill button at the bottom of the army interface. Any army with a leader assigned can be drilled (unless it is composed entirely of mercenaries). While drilling it will incur the full maintenance cost regardless of the army maintenance slider on the budget screen, and its morale will be lowered severely. At the end of each month, the drill value of each non-mercenary regiment in the army will increase by a base of +0.83 per month, amplified by any drill gain modifiers. Since mercenaries do not benefit from drilling, it is recommended to detach them from drilling armies if the maintenance slider is low, in order to save money. During drilling, the leader of the army also has a chance of gaining additional leader pips. This likelihood depends on how much of the army they are drilling, relative to the force limit (around 10% yearly chance at 100% of the force limit currently drilling in a single army led by the leader). Amphibious landings from transport fleets will always take 12 days to complete if moving into non-hostile territory, and 36 days if moving into hostile territory. Boarding a friendly transport from land will always take 12 days as well. These times are reduced by the maneuver rating of leaders. If an army stops in a province in which two hostile forces are engaged in combat, it will wait on the sidelines and engage the victor once it emerges from battle. The victor from the first battle will now act as an attacker, and will suffer all terrain penalties appropriate for the province (unless that side controls a fort in the province, in which case it is the defender as normal). On the other hand, if only one of them is hostile, the newly arriving army will join the battle on the other side even if the non-enemy army is fighting in a different war. During peace time, only armies led by a conquistador may enter terra incognita provinces and explore them. In war time, all armies may enter terra incognita provinces if that province is controlled by hostile forces. If a terra incognita province is revealed while an army is attempting to move into it, its movement progress will immediately be updated, which can result in it teleporting into the province. ↑ 1.0 1.1 1.2 1.3 1.4 1.5 1.6 See in /Europa Universalis IV/common/defines.lua. ↑ 2.0 2.1 2.2 2.3 2.4 2.5 2.6 2.7 See in /Europa Universalis IV/common/static_modifiers/00_static_modifiers.txt (Static modifiers). ↑ The 2% result from LAND_MAINTENANCE_FACTOR which is set by /Europa Universalis IV/common/defines.lua to 0.25 divided by 12 and round after 3 digits. This page was last edited on 17 January 2019, at 21:33.